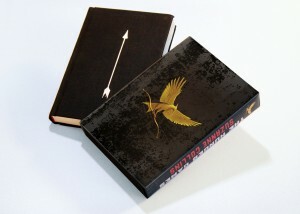 The Compulsive Reader: The Hunger Games Collector's Edition! Scholastic tells us that this book "features an elegant foil slipcase featuring all-new Mockingjay artwork, the bestselling original novel with a cloth cover, foil stamping, and deckled edges." Sounds very cool! And since it's coming out on the 30th of November, you can go ahead and put it on your Christmas wishlist! What do you think? Do you think you will get the collector's edition when it comes out? This is definitely going on my Christmas list! I probably don't need another copy ;) Not unless it comes with Peeta himself. Lenore: HA! I like the way you think! I have the ARC and finished copy of the first two books and just the finished copy of the third book. I definitely do not need another copy either, especially at $30, but it is pretty to look at. I have 200 copies! Tee hee! I read them with my 8th graders. I would love to get this but it is a bit pricey. *Sigh*. Oh well, it's still lovely.